Communications within your group and to a shore contact or emergency services are a vital part of safe paddling. Let someone know before you go and be able to raise the alarm if you get into trouble. Good Group Management involves keeping the group together so you are all within communication range - preferably voice range. A whistle is a good way of getting their attention. A Marine VHF radio allows communication between the front and back marker of the group or with nearby vessels. For communications between your group and the shore, a mobile phone is usually the simplest method, provided you have coverage, allowing an explanation of any problems or delays. Make sure your phone is in a waterproof case such as a Lifeproof Case and/or an Aquapac. Your communications gear should be rated for water resistance or in a waterproof case or container, while still being easily assessable when you need it most. Most waterproof ratings on electronic gear are based on resistance to water pressure - equivalent to immersion for so many metres for a period of time. One good trashing in surf may be the equivalent of that! Check your gear - are there openings that make the unit vulnerable to water ingress? If there are, put it in a waterproof container (for example an Aquapac). If you are paddling in an area where there is good mobile phone coverage, this is the simplest communication solution to talk to the outside world. Make sure that your phone is in a waterproof case such as an Aquapac, that also has a lanyard so you can tie it to your PFD and not lose it overboard! We double up on the waterproofing and use a Lifeproof case as well. Limitations on mobile phone use are of course areas of limited coverage, and in choppy conditions you might not be able to have two hands free to dial or answer - this is where the one-handed operation of a VHF Marine Radio is useful. The simplest and most basic forms of communication on the water do not require fancy equipment! Your group should all be within voice range! If you need to get their attention a whistle signals "Stop, Look and Listen! ", followed by voice or paddle signals. In the marine environment at pea-less whistle such as the Fox40 is ideal. We always have one attached to our PFD by a short lanyard, so as to be quickly accessible. The most effective method of simple and concise communication on the water is by paddle signal. Once you have the groups attention using your whistle, the paddle signal quickly indicates what you want them to do. Go: Vertical paddle - like opening boom gate. Are you OK? : One hand on head ask the question, mirrored for the affirmative. No reply if not okay - leader will go over and see what is the matter. A handheld Marine VHF Radio is a useful communication tool to assist in group management - allowing efficient voice communication within the group of paddlers. It can also be used to communicate with vessels and shore stations (Coast Guard) in emergency situations. Paddler support in many ocean swimming races now are required to have a VHF radio. Many Personal Floatation Devices are designed with a communications pocket in the front - a radio such as the ICOM M35 is sensitive enough to pick up voices while in the pocket - allowing for one-handed operation. The ICOM M35 and M23 are small units suited to fitting in a PFD pocket - and are waterproof to 1m for 30 minutes. Generally we do not need to put them in an Aquapac (though radio-shaped Aquapacs are available), unless conditions are likely to be very challenging. Rinsing in fresh water after a trip is recommended to remove any salt. There are protocols involved in the use of a Marine VHF Radio and it is therefore a requirement that you should be licensed if you are broadcasting over this network. Emergency communications when phone calls are not possible can be accomplished via satellite - a Personal Locator Beacon (PLB) or EPIRB. These are purely for emergencies, when life is threatened. A simple spring loaded flap covers the activation button preventing inadvertent use. The PLB is activated by extending the antenna, flipping open the yellow flap and pressing the red button. This can be done one handed (using teeth for the antenna!) but remember if you need to activate it you are likely to be in challenging conditions - wind, seas, cold and tired, so part of your trip or expedition prep should include practising setting off the PLB. It has a Test Mode that is used to check the battery so you shouldn't accidentally call the emergency services. The SPOT Gen3 Satellite Messenger is a must-have item for anyone who enjoys an active lifestyle in the outdoors, where cell phone coverage is limited, or non-existent. It uses reliable communication satellites to send specific GPS location to others in real-time. Ideal for boating, camping, fishing, hiking, hunting, pilots, sailors, and backcountry skiers, the SPOT messenger helps keep people in touch with friends, family, and safety personnel at the touch of a button. It is designed for use with an online account (yearly subscription) that can be used by family and friends to stay updated on your status. You can even connect your SPOT updates to automatically update to Facebook. The CHECK IN feature, known as SPOTchecking, allows users to notify their SPOTteam (friends and family pre-determined as contacts) that all is well, notify them of your current location, or save waypoints to review the route at a later time. Once activated, your SPOT contacts receive an SMS text message to their mobile phone with your message and coordinates, or an email with coordinates and a link to Google Maps showing your current location. The ALERT 9-1-1 function can be used in the event of a life threatening or other critical emergency to notify emergency services of your current position and request assistance. Once activated, SPOT will acquire its exact coordinates from the GPS network, and send that location along with a distress message to a GEOS International Emergency Response Center (ERC) every five minutes until cancelled. The ERC will then notify local authorities including police, highway patrol, the Coast Guard, the country's embassy or consulate, search and rescue teams, and more. Note that this does not actually replace the EPIRB/PLB requirement of some Australian states for coastal waters 2nm or more offshore. What is the difference between a PLB and an EPIRB? In many states of Australia legislation requires paddlers to carry an emergency beacon when paddling more than 2nm offshore. Some states such as Tasmania state that this can be a PLB - small and compact, able to fit in the pocket of your Personal Floatation Device; while others, such as Victoria, state you must carry an EPIRB (Emergency Position Indicating Radio Beacon). Why is that? EPIRBs are quite large, and while they are great on your yacht or power boat, they are not going to fit in your PFD pocket! They do, however, have a big advantage over PLBs: they float upright. With a PLB you will have to hold the device vertically and out of the water or the signal will not be received by the satellite. EPIRBs are also designed to start signalling once immersed - so it would need to be kept in a watertight container. To deploy, take it out, attach it to something (preferably yourself rather than the kayak), allow it to float and it will do the rest. This then is part of your expedition training and preparation - what beacons to carry and where they will travel - ease of access and deployment in an emergency. Something to practice prior to paddling in challenging conditions or committing expeditions! The benefit of electronic distress flares is that they are safer to deploy, reusable and much longer lasting than conventional pyrotechnic flares. It does not yet replace the pyrotechnic flares required for coastal offshore use (>2nm) in legislation. The rescueME EDF1 electronic distress flare has a unique lens design, which combined with the use of advanced LEDs and highly efficient circuit technology ensures a constant level of light output throughout the life of the user-replaceable battery. The compact size and rugged design means the rescueME EDF1 is the perfect safety product for your kayak, grab bag, life raft or hiker’s backpack. The Greatlands Laser Rescue Flare is a legal signalling device that can be used to signal for help at night for distances up to 32km (20 miles). The laser is a slightly flared vertical beam (not a pinpoint beam) that flares out slightly over distance. Point the laser output end (laser aperture) toward the target. Make a "V" with your outstretched hand over the intended target. With the laser held near your eye in line of sight, slowly scan the vertical laser back and forth VERY SLOWLY (approx. 5 degrees per second or slower) between your fingers toward the target, making each finger red as you scan. Keep signalling until you have positive contact with your rescuers or target and they are able to see you without the use of a signalling device. It is powered by a lithium battery that will give 40 hours of continuous use. The construction ids rugged and waterproof - we have had these in our PFDs for some years now without any special maintenance (other than when we rinse the PFD) and it still works. The benefit of this flare is that you can pack it in your gear for taking on ferries or planes when going on a trip, which you cannot do with pyrotechnic flares. A waterproof strobe light attached to your Personal Floatation Device (PFD) is of assistance in making you more visible during emergency situations in a low-light environment. 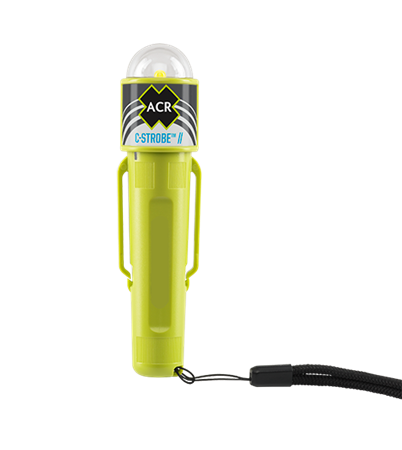 A strobe such as the ACR C-Strobe can be attached by velcro or a clip to your shoulder strap (or inflation tube) - try to position it out of your line of sight but still reachable so it can be easily activated (twist activation). There are three signal modes: Steady on, Strobe and SOS, which will operate continuously for over 120 hours with a 45 lumen LED light. This model of strobe is manually activated, but an automatic model that activates on contact with water is available - suited for yachts and power-boaters. A signalling mirror is another good addition to your safety tool kit. You can make one cheaply from reflective metal or part of a CD - with care that it is not going damage you if crushed in your PFD pocket! Purpose-made signalling mirrors such as ACR's Hot Shot Signalling Mirror have some useful features like a red dot holographic sighting to ensure you are pointing at your target. It also has a lanyard to attach an a whistle. A set of pyrotechnic flares are a requirement when paddling 2 or more nautical miles offshore - a flare kit comprises 2x orange smoke flares for daylight use and 2x red hand flares for night time use. You can also purchase rocket flares as a separate kit. Your flares should be stored somewhere you can readily reach them in an emergency, but not where they will get constantly wet over a long period of time. If you store them in a sealed bag make sure you can get that bag open with cold wet hands! While it is law to keep a flare kit on board if venturing more than 2nm offshore, we recommend you carry at least one of each type of flare at all time (even on enclosed or inland waters). They do have a shelf life and are intended to be replaced every 2 years - there is an expiry date printed on them. Flares are intended to get the attention of emergency services once they are in the area - set them off when you can see your searchers approaching.